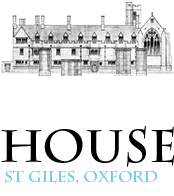 The Gifts of the Holy Spirit In 1935-9, Sir Ninian Comper's chapel of the Resurrection in Pusey House, Oxford, was installed. A beautiful gold civory stands over and around the Altar. 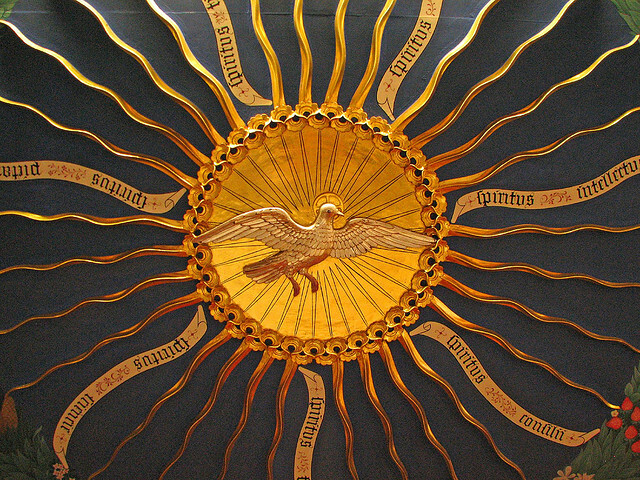 The underside of this civory is painted with this image of the Holy Spirit, sending forth his seven gifts, which is surrounded by a wreath of fruit and flowers, symbolising the fruits of the Spirit. This in turn is held up by dancing cherubs, perhaps indicating the angels' joy in the sanctification of the human person by the power of the Holy Spirit. In the early days of the Church when a person had been baptised they immediately went to stand in front of the bishop who would lay his hands on their head and pray that the Holy Spirit would confirm (strengthen) them in the faith they had been baptised in. Gradually (in the western Church) confirmation became a separate service, mainly because as the Church grew bishops covered an area rather than just one church and so could not get to every baptism. Confirmation involves a commitment from the person being confirmed - they commit themselves to following Jesus as his disciple. Confirmation is administered by a Bishop. It is not appropriate to ask children to make the sort of commitment involved, so Confirmation is rarely given to anyone under 11 years. Like Baptism, you can never be too old to be confirmed. If you would like to know more about Confirmation, or would like to talk about being confirmed, please contact us at any time.